Lorenzo Cain tends to tee off on left-handed pitching, but Chicago Cubs starter Jose Quintana should be extra wary when facing the Milwaukee Brewers‘ star center fielder Friday night at Miller Park. A career .314 hitter against lefties, Cain has been one of the best hitters in the majors against left-handed pitchers since the start of last season. Cain is hitting .375 against lefties since the start of 2018, second only to Detroit Tigers outfielder Nicholas Castellanos (.383) over that span. Quintana will put that average to the test. Now in his third season with the Cubs, Quintana has a 1.62 ERA in 11 career starts against the Brewers, the lowest ever amongst players with at least 10 starts against Milwaukee. Quintana has allowed just three earned runs in his last three starts combined against the Brewers, including his most recent outing against Milwaukee: Game 163. He allowed six hits and just one earned run in that game against four strikeouts. Quintana didn’t allow a home run in his first appearance of the season, but should probably be a little concerned about the longball. 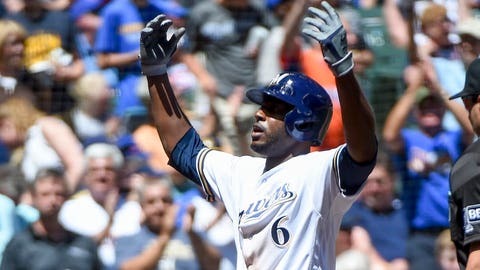 Home runs have accounted for 46.2% of the Brewers’ offense since the start of last season. Only the Toronto Blue Jays (46.8%) and New York Yankees (51%) have a higher such percentage over that span. It’s working out pretty well for Milwaukee. The Brewers were just one game away from the World Series last season, and are off to a 6-1 start in 2019, one of their best starts in more than a decade. The 2008, 1998 and 1995 Brewers also started 6-1, while the 1987 Brewers started 7-0. — Jesus Aguilar has been among the league’s most productive hitters since joining the Brewers in 2017. He has an RBI percentage of 18.1% over that span, second in the majors. — The Brewers have the third-best home record in the National League since the start of last season at 54-31. — Right-handed batters are hitting just .226 against Brewers pitchers since the start of last season, the second-lowest such average in the majors. — Anthony Rizzo ranks second on the Cubs with five RBI this season. He’s racked up 100-plus RBI in each of the past four seasons, tied for the third-longest such streak in Cubs history.